After just a few seconds of admiring the Hagstrom Tremar Viking Deluxe, we just couldn’t leave it off our chart of the best jazz guitars – it’s just beautiful! Established in 1958, the Swedish brand has a platoon of fans and many professional artists using their instruments including Kurt Cobain, Elvis Presley, David Bowie and Jimi Hendrix. One of their most iconic guitars is the Viking, and this delightful mid-range semi-hollow body reissue is an awesome tool for any jazz guitarist. Let’s see how it stacks up. As Hagstrom say, the Tremar Viking Deluxe is indeed dressed to kill. Although it is actually based on the original Viking from the 1960s, this modern reissue feels quite contemporary in style. The Viking’s 24.75” scale length body is made entirely from laminated flamed maple – not that you’ll know it from looking at it, as the whole thing is enrobed in a deep glossy black paintjob with elegant white body binding adding great definition. The neck is made from Canadian hard maple and set into the body. Under the hood is Hagstrom’s patented H-Expander truss rod, which – in a nutshell – provides incredible rigidity, to allow for a very low action and thin neck. Combine this with the double cutaway and you’ll find that all 22 frets are entirely accessible. Hagstrom use Resinator as the fretboard material, which is a stable and consistent composite with a similar sound profile to ebony, and one that is very welcome in this guitar. This is finished with striking pearl block inlays, to complete an all-round luxurious look. The only thing lacking a little was the setup out of the box – it feels in need of a little attention to reach optimal playability. Otherwise it’s a beautiful model with a reassuringly heavy weight and solid feel. Most notably, this Viking is kitted out with two Hagstrom HJ-50 covered humbuckers at the bridge and neck position, controlled by an individual tone and volume control for each pickup, along with a pickup toggle switch on the upper bout. Hagstrom go to town with the rest of the hardware on this Viking, as it sports a set of fantastic tuners with a very distinctive pyramid design and precise 18:1 tuning ratio. These tuners, combined with the self-lubricating GraphTech Black Tusq XL, keep tuning very stable, while the chrome tune-o-matic bridge and that excellent Hagstrom Tremar Vibrato tailpiece allow for beautiful on-board vibrato effects. Onto sound and it’s just as lovely as the design and build. Acoustically, it doesn’t have a big projection, although it certainly more than audible for practice – more so than your standard electric guitar anyway. Through the humbuckers is where it excels, offering the distinctive Hagstrom tone that’s won over so many players through the decades. There’s a vintage midrange-heavy feel, which can produce some wonderful sounds ranging from the smooth, warm tones that jazz players crave, right up to bright bell-like tones for lead playing. It’s easy to see why the Hagstrom Tremar Viking Deluxe is such a popular model. Despite a few setup issues, it’s a solidly built guitar with great design, playability and tone for jazz guitarists – although it feels versatile enough to cope with any vintage-tinted style. A worthwhile contender. 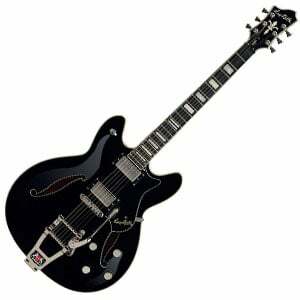 For more info about the Hagstrom Tremar Viking Deluxe, click here. when comparing the G5420t with the Hagstrom Viking Tremar hollowbody which is the bigger body including thickness?